In a time when the West pushes its deficient values and misguided moral codes on the cultures of the world, it is imperative that Muslims realize the completeness of the guidance of the Messenger of Allaah (may Allaah raise his rank and grant him peace), and realize that our true honor and distinction among the nations, as well as our success in the Hereafter, lies in embracing his guidance, in all affairs of belief and action. Based on the scholars’ continual advice to the Muslim youth, combined with the specific need that Muslims in the West have to understand and implement upright moral character, the importance of this book and the need for its translation into the English language becomes crystal clear. 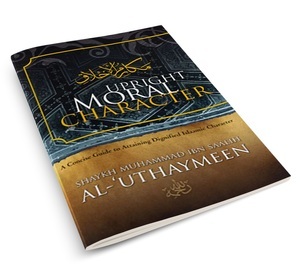 And what better guidebook than one based on the character of the Messenger of Allaah (may Allaah raise his rank and grant him peace), authored by an exemplary scholar like Shaykh Ibn al-‘Uthaymeen, known for his outstanding manners!